If you have played games like Brutal Age, then Final Fantasy XV: A New Empire needs no introduction. You will have to keep constructing buildings and upgrade them until you make your empire stronger. 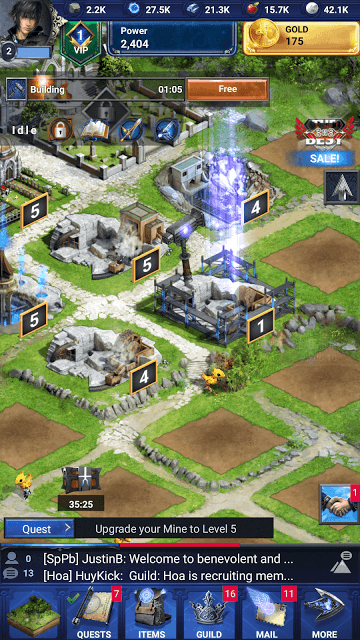 Level-up your citadel to unlock new buildings, train troops and send them to raid other player bases for loot and rewards. The game also lets you hunt monsters straight from the FF universe. Killing them will grant crafting materials. The best part of this game is that it features your favorite characters from the Final Fantasy universe. Resource buildings can be built on empty slots outside your empire’s wall. You will notice that there are several empty spaces that allow players to build more resource-generating buildings. Having multiples of each building guarantees a steady flow of resources. There’s no harm in having more than 2 farms or more than three quarries if you want to improve food/stone production. Along with constructing more resource buildings of the same type, you should also consider upgrading each building to boost production. Have More than Two Quarries and Upgrade Them: Quarries produce stone and having multiples of this building ensue you keep generating stone. Also don’t forget to upgrade all quarries to boost per hour stone production. Complete Hero Quests: Completing hero quests is the easiest way to get lots of resources in a very short period of time. All you have to do is press the Start button beside each hero quest. 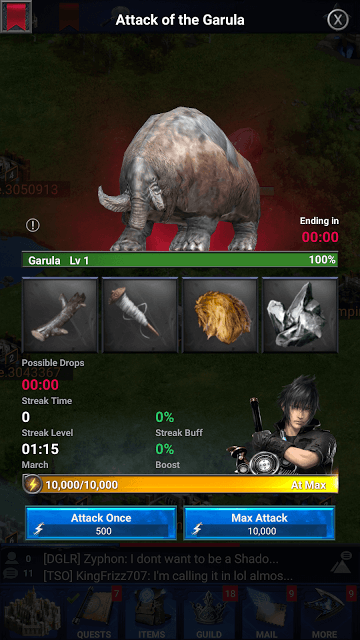 Once the timer ends, tap “Collect” to get Hero EXP, Gil, Stone, Energy, Metal and Food. Always start with the Basic Hero quest as it requires a few minutes to complete. You can go for common quests to get better rewards. Start a quest that requires more time to complete if you are planning to go offline for a few hours. 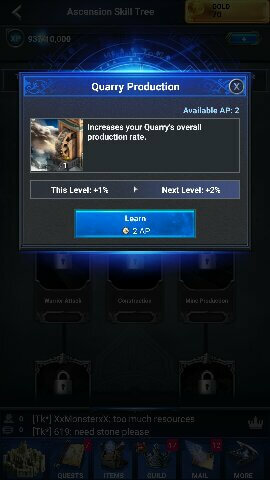 Spend AP (Ability Points) on Quarry Production: This should be one of the first things to do if you are seriously looking to get more stones. Tap your hero’s profile pic at the upper-left corner of the screen and then tap “Skills”. Now Tap “Quarry Production” and press the “Learn” button. You will need two ability points to learn this skill, so make sure you level up your Hero to earn APs and then use them to upgrade this skill. Complete Empire Quests: Noticed the quest ticker at the bottom of the game screen? Well, just tap it and complete it to finish an “Empire Quest”. Now tap the “Quests” tab and you might see a green tick beside Empire Quests. Tap it and press the collect button to get resources, including stones. Join a guild and then set up a trading post. You can then ask for stones from guild members. If you have just started playing, then you may have noticed that your empire has a protective shield on the world map. The protective shield suggests that other players won’t be able to attack your empire for a limited period of time, usually 24 hours. Take advantage of this and complete quests displayed on the ticker at the bottom of the screen as quickly as you can to make your empire stronger. Keep building and upgrading all recommended units and don’t forget to upgrade your citadel to unlock new buildings and get additional rewards. You may also get an additional 8 hour protection from Luna soon after the 24-hour protection ends. You might also receive another 24-hour protection while playing the game. Protection items can be found under Items > My Items > War. Don’t forget to claim all Empire quest rewards via the “Quests” option. This will let you collect additional resources, Hero EXP and Power. Joining a guild has plenty of benefits: You will receive free gifts from guild members, get access to the exclusive guild store and earn loyalty points for helping allies. The one big benefit of joining a guild is that you get free speedups on your timers. You can speed up time if an upgrade requires less than 5 minutes to complete. For upgrades or construction time over 5 minutes the “Free” button does not appear. By joining a guild, you can speed up time by asking for help from fellow guild members. Just tap the “Help” button and if any player is online, he she helps you by speeding up time. You too can help members by tapping the handshake icon to the right side of the screen. At first you can receive only few speed-up assists from your guild. But as you level up your Citadel, the help count increases and you get more help from members. Getting more speed assists decreases the upgrade timer faster. Don’t forget to check out the Guild store soon after joining one. You can purchase several important items such as resources, speed ups, empire protection and special items using loyalty. Keep helping guild members to earn loyalty. However, there is a daily loyalty limit so keep an eye on it at the Guild Help section. You can also request resources from your guild members. Build a Trading post and trade resources from other players. 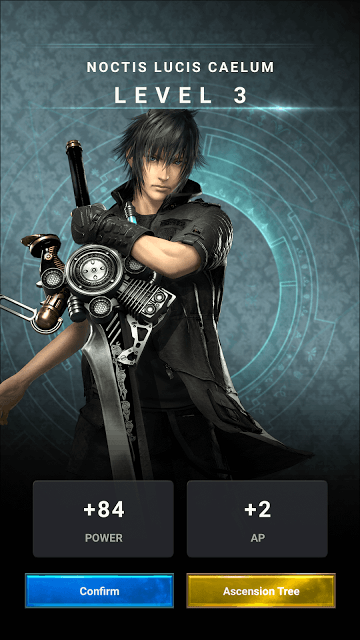 You can get Hero AP (Ability Points) in Final Fantasy 15: A New Empire by leveling up your hero. To reach a new level, you must gain EXP. You earn a little bit of EXP after upgrading each building. Keep following empire quests (look for quests at the ticker in the bottom of the screen) and then collect rewards by tapping the “Quests” button. You will get EXP every time you claim rewards for a completed quest. You will get lots of Hero EXP if you take up Guild Quests. You just have to tap the start button beside a guild quest and wait for the timer to reach zero. Now press the collect button to get Hero EXP. Complete the quest that takes the shortest time to finish. You can then finish those that take more time to complete. It will take around 4 hours to reset guild quests so don’t panic if you don’t see a Basic quest soon after completing one. To get plenty of EXP, start the uncommon quest. coordinates. Your friend should know the name of your empire, so make sure you rename your empire and choose a short name. You can use the “Empire Rename” item to change your empire’s name. 2. To mail you his empire’s co-ordinates (X, Y), your friend can tap the “Mail” tab at the bottom of the screen and then tap the compose button at the upper right corner of the screen or he can just message you his coordinates via other means, such as WhatsApp. 3. Go to your world map and tap the magnifying glass icon on the top of the screen. Enter your friend’s empire co-ordinates. 4. Now Tap his empire and press the Join Guild button. You can also move your empire closer to your friend’s empire by using the teleport item. Tap an empty space near your friend’s empire and then press the “Teleport” button. You should have a teleport item. Go to Items > My Items > Special. You can get free teleports. Just keep completing empire quests, level up your citadel and you might get one free. Also, look for any gifts from Luna under “Mail”. Advanced teleport item transports your empire to a location of your choice, but within your realm. If you are in need of crafting materials for your empire, then hunting monsters is probably one of the best ways to get them for free. Tap the world map icon at the lower-left corner of the screen and scan the map for monsters. You will notice strange creatures moving around. Tap a monster to know more about it. You will need to fulfill certain conditions before you can hunt a monster. You must be in a guild to attack monsters. Also, you should research Monster Tactics at the University before attacking a creature. For example: To attack a level 2 creature, you will need to unlock and research Monster tactics Level 2. Dealing greater damage with each attack increases the chances of an item drop. To deal more damage, you can use the monster attack boost, which can be found at the items and Guild store. Upgrading each resource building should be on the top of your to-do list. There are four major resource-generating buildings: Farms (produce food), Quarry (produces stones), Mine (produces metals) and Energy Extractor (produces energy). There’s also a Bank that generates Gil for your empire. Upgrading each building increases the production rate per hour. You can start scouting once you have researched it at the university and joined a guild. Scouting is available under “combat”. Before attacking an empire, tap it and then tap the “scout” button. Scouting not only lets you know your enemy empire’s stored resources, but also gives you an estimate of the number of defending troops. You might think twice if the number of defending troops is higher than your troops. Scouting will help you attack those empires that have a lower number of troops. Once you get to a certain level, just to stay competitive, you will need to spend loads of real money just to get the resources and speeds needed to do the building upgrades and research. Level 28 to 29 takes billions of each resource to complete the building upgrades. I’m not trying to turn anybody away from the game. I like the gameplay and the graphics, but it will take real money to go anywhere. Attacks discourage new players. You have to learn the game’s mechanics. The urge is to protect your empire but that’s not how the game works. Most attacks are from more powerful empires. As a newbie, you will almost always lose. Multiple attacks in quick succession frequently occur. What to do? Until level 15 which takes a long time to achieve, if you have no troops or traps inside your empire and your on-hand resources will fit in your vault, the attack HAS NO EFFECT. Build & research to use you resources as you earn them. Build no traps. Either have no troops or send them gathering, or park them in an empty part of the map. When the attack occurs, the graphics will show your empire burning but if you read the report, nothing actually happened. All buildings continue to produce. The burning graphic goes away in a few minutes. To clarify “make multiples of resource production”: fill all 25 squares outside the wall. A good starting mix is 12 quarries, 6 mines, 4 farms, 3 energy extractors. Inside the walls, make 6 banks. Note that you have to upgrade each of these on every level-up. You will still run out of resources & have to wait for generation to catch up or spend in-game gold, or start down the slippery slope of paying with real money. I hope there is an event of heroes, where we can fight other heroes.